In the uncertain September of the equinox, two-hearted Imperia is hosting this meeting of classic motoryachts. What a strange destiny this west-coast town has, always united and divided, its interminable dichotomy marked by the furrow of the river Impero. With little distance between them there are different motorway exits, dialects, saints and philosophies. You've got San Maurizio? Well we've got San Giovanni! You've got the Vintage Sailboats? Huh, we've got the Motoryachts! Which is yin and which yang? The virile woodland with the promontory stretching skyward, or the warm and welcoming slope on the opposite bank? And so on, leaving the debate open. The important thing is that the contrapuntal energy flow should generate a flow of tourists, so even somewhat out of season there's a bit of cash coming in. Not bad if there is also a cultural input for the spectator who looks beyond the glitter of brass and wood and if the sponsors get a good image return. One may wonder what leads certain yards to build "out of step" vessels, using either materials or designs that are dated in comparison with current trends. The wharf in Imperia is a good place to see some of them. 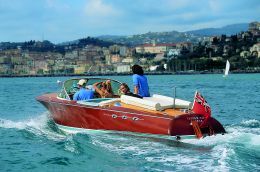 The Glisenti of Lake Como showed their Asso, a 7 metre runaboat with somewhat retro lines: keel, frames in oak, planking in mahogany glued with special techniques, very fine details, hypervitamin engine. The passion for creating a founding father of one-off pieces! 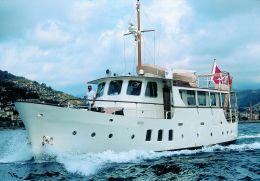 On board the Langoustine (built in 2003) we met Luigi Mostes, designer and builder of this elegant 19 metre lobsterboat. "I visited the New Jersey coast, towards Atlantic City. Their lobsterboats had already been discovered in the 1930's by rich New Yorkers who fled to the coast from a tuberculosis epidemic in the city. These local boats, seaworthy and fast, were ideal for getting to the office and swiftly returning to more salubrious areas. 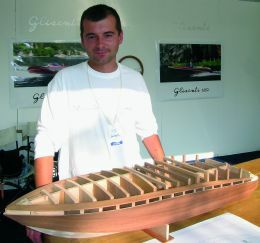 There's no reason not to build them in wood where cost isn't a problem: there's a better distribution of weights, heat insulation, absence of emanations, rigidity and, not least, getting a one-off boat. This is our second lobsterboat. 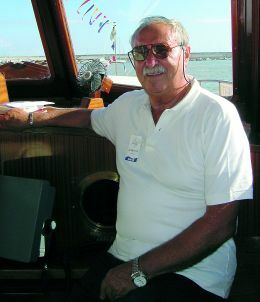 The first, Leontine, has been sailing tranquilly for several years." Not all of the seventy-plus enrolled yachts have arrived, this due to adverse weather conditions. But fifty or so of the most audacious, or maybe the ones with a shorter voyage to make, are moored at the Anselmi landing-place in Oneglia. Some of them fully qualify as superyachts - which they were when they were launched - while others are rough, former working boats with a long history of sailing and risk. And there is certainly no lack of those motorboats that marked la dolce vita of high society down along the coast, east of St. Tropez: the famous Rivas and again the little breakneck boats of races at sea, "three-point" and everything else. All in all, for a varied slice of nautical history the meet scored a very good point in favour of Oneglia! Let's take a quick glance at the vessels on show: Meltemi, in spite of herself, somewhat became the meet's symbol boat with her presence on the affiche. The guise of a refined Edwardian yacht conceals a real ship, built with ocean-going criteria. Since her launching at the yard in 1931 she has circumnavigated the planet, made innumerable Atlantic crossings, taken part in World War II as a patrol vessel and hospital ship, has been sunk and then salvaged, and in her endless vagabondage between the 80's and 90's even had the singer Elton John aboard who, it appears, composed best at the piano in her music room on the main deck. Meltemi achieves considerable speeds thanks to her fine lines: the two 480 HP Caterpillars give her a cruising speed of 12 knots and a maximum of 14. 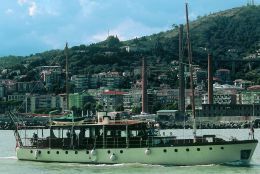 Dionea is a small liner, built in 1962, which began as a ferry on the coasts of the other sea, between Venice, Trieste and the Yugoslavian coast. It was completely rebuilt in Genoa (2002). Now its 51 metres, which once took up to 320 passengers, host 12 wealthy guests who enjoy service of the first order, with three dining areas, various suites, saloon bar, sundeck and even a skipper from Camogli. The Maltese cross flies at the stern of a little twenty-odd metre ship that is not exactly thrusting: the M/Y Noneta, launched in 1935 at the English yard S. White & Co., can boast of being number one on the Maltese pleasure craft register and, like many British vessels of the period, can show the "Dunkirk boat" plaque for services rendered on those beaches. She has now been completely restored, from sheet-metal to engines and period interiors. It was a shame that bad weather prevented a lot of Rivas coming, as envisaged, from Villefranche sur Mer where they had just had a meeting. However the few that did arrive convincingly demonstrated their seaworthiness on the coastal voyage to Marina di Aregai with a fairly heavy sea running. Because all in all the relaxed atmosphere at Oneglia consists precisely in this: outings, competitions of cookery and elegance, and no races! Nobody has to gain pole position for an improbable vintage Valencia, and everybody goes home happy and without damage, as it should be. Red, a fine 1947 English displacement M/Y with a thousand vicissitudes, is the floating headquarters of Riva Historical Society president Piero Maria Gibellini and functions as a clubhouse for the small number of bold racers. We point out that the technical sponsors of this event are the RHS and the ASDEC. In the waters of Imperia you also see a few founding fathers: for example PiGio Per Sempre, a 1974 Admiral 19, a one-off with, in its DNA, the lines of modern Lavagna superyachts. Her keenly enthusiastic owner keeps her in gemlike condition. 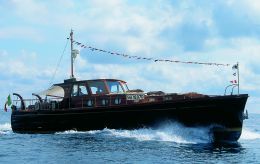 Then two Portofino Pilots, or again Roberta, a 1966 Baglietto belonging to the fleet of Ugo Baravalle, one of the great Mediterranean collectors. There is a very close relationship between Imperia and chartering, which is only normal. If the great modern motoryachts sail one month with the owner aboard and the rest of the year with guests, why not vintage vessels? Stella II, Five Star, Dionea and El Bravo (noted for playing host to Gheddaffi), all of them 1970's luxury charter yachts, lead us to forecast development of the event also in this direction. Two fairly similar vessels side by side at the quay stand out for their elegance: La Ghibellina and Langoustine. The style is lobsterboat and their recent construction is a fine example of the new classic. On this subject we had a chat with Langoustine's designer, the engineer Luigi Mostes (see box). Amid trumpeting and puffs of steam there had to be the Pietro Micca, an 1895 tug powered by both coal and fuel oil. She worked uninterruptedly until 1993, her last task being to supply steam to the USA fleet based in Naples. 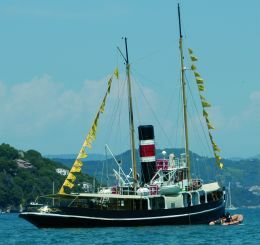 Now the old gladiator, managed by the "Associazione Amici delle Navi a Vapore G.B.Spinelli" of Fiumicino, is enjoying a well-deserved rest, revered and spoilt, taking part in various events. 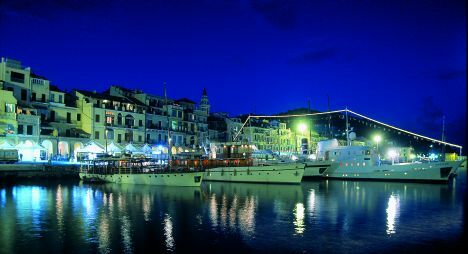 Oneglia is worth visiting not only on the water but also on the quays. 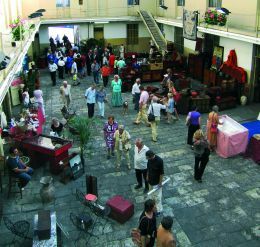 There are various activities of a Ligurian-gourmet nature which are always interesting, plus an exhibition of racing vessels and a marine antique market that always attracts attention. The organisers are two Genoese girls, Barbara and Angela, and though only the auctioneers Cambi really have a stand with considerable nautical items, all the other exhibitors have something or other. There is an enchanting contrast between the industrial archaeological location of the old Bonded Warehouse and the beauty and charm of the pieces on show. Mention must be made of the presence in Imperia of the ship Argo, an Italian Navy vessel detailed as a prestige yacht for top state dignitaries. It was built in 1971 by the Italcraft shipyards, in mahogany and iroko, as a submarine support vessel. Twenty-four metres long and fairly fast, today it looks like an elegant motoryacht with a classic and somewhat severe layout. Commander Giovanni Maggio, the ship's captain, showed us around. It made a certain impression to think that in these cabins, where I was nipping around with the tripod taking a few photos, the Number One of the Republic also moved around in his moments of relaxation, maybe even in swimming trunks! 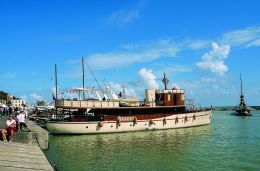 Near the Lady Rose, a Turkish built caique remarkable among other things for the owner's bedroom surrounded by the concubines' beds, two perfectly restored 1930's vessels are moored. One is the steel built Poseidonia, Dutch school, restored a few years ago in Sanremo and looking steady and indestructible. The other is a 35 metre of English construction. Recovered in disastrous conditions she spent two years at the Mondomarine shipyard in Savona and was launched, in July 2004, to the voice of Judy Garland singing "Over the Rainbow". The Belgian artist Jean-Michel Folon was very kind to send her to Imperia, perhaps a final 'thank you' to the Mediterranean, to the sea that has given him so many nuances of colour. This meeting saw a return to the control cubicle of Giorgio Marziano, deacon of the Imperia Assonautica and one of the "founding fathers" of Vintage Sailboats: ".the Cassa di Risparmio Bank of Genoa and Imperia, Olio Carli and Panerai Watches, the main sponsors, can only be satisfied, and the synergic action of the two events forecasts only favourable developments for everyone..." And the motoryachts cast off, leaving to the notes of Vivaldi played by the Turin Philharmonic and its splendid solo flautist, with the next date fixed for September 2007. As for sailing enthusiasts, we'll see you next year in the other dock at Porto Maurizio.